Research by Dr. Paul van den Broek from the University of Minnesota concluded that preschoolers' ability to make meaningful connections between events in their lives and stories in books is a strong predictor of later reading comprehension. Parents can increase comprehension by more actively involving children in the reading experience. Studies have shown that there are significant gains in children's literacy skills when parents and children talk during shared reading times and children have a chance to explain how a story relates to their own lives. Use the calendar as a number line for simple subtraction problems. For example, start with May 10. Ask "What date is two days before May 10?" Count down two days. Write the subtraction problem: 10 - 2 = 8. Go to the Library and check out at least three music CDs. Try jazz, Latin or orchestral music especially for children. Pick up a copy of the Library booklet, "Nursery Rhymes, Songs and Fingerplays." Make up a song or tune that includes your address and phone number. Sing it together so your child can learn both. Visit the West Bloomfield Township Public Library and pick up a copy of our nursery rhyme brochure. Singing with your child is an excellent way to learn basic melodies and rhythms as well as counting and rhyming skills. 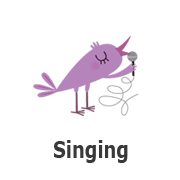 Check out a CD or use an app like Hoopla to download songs and sing along with music. This is a fun way to spend time together. Dancing with your child is another fun way to encourage music appreciation while spending time together. The ability to dance and move to the steady beat (rhythm)is essential to all future reading skills and fluency.